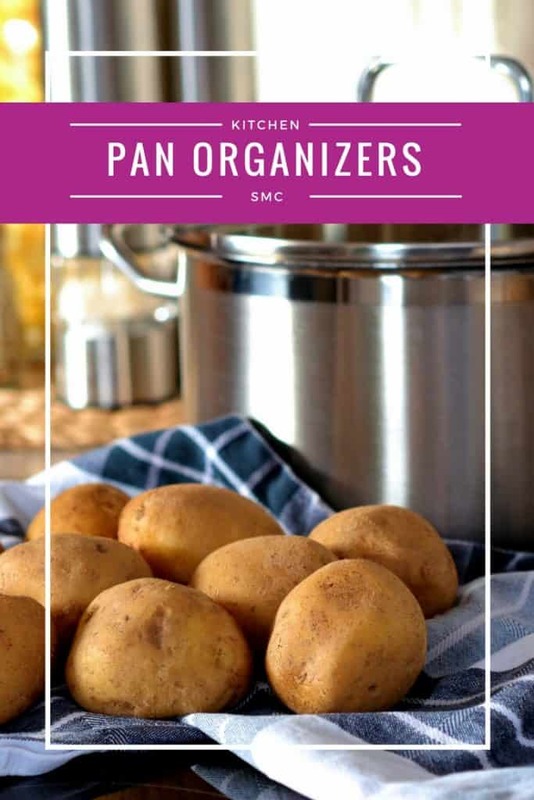 How to Organize Pots and Pans so You Can Get to Them Easily! Home > Life Hacks > How to Organize Pots and Pans so You Can Get to Them Easily! 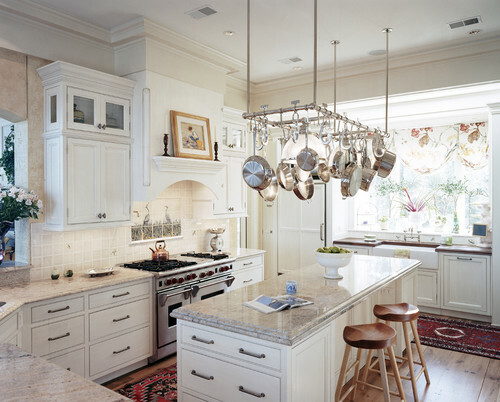 When it comes to kitchen storage solutions one of the most frequently asked questions is “how to organize pots and pans?” After all they come in all shapes and sizes, so they don’t always fit neatly into the cabinet. The go to solution is often to nest one inside the other, which is great for storing, but not so great when you want to use the pot in the middle of the stack! 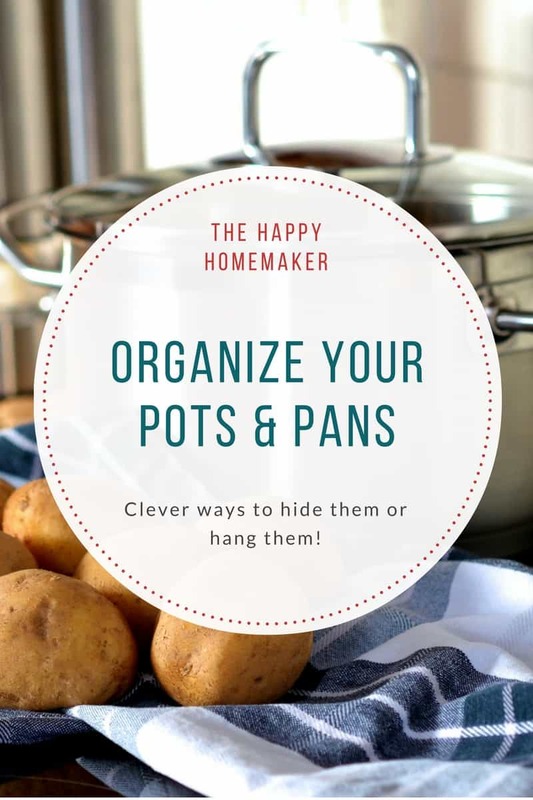 We’ve had some fun this week researching all the clever ways you can store your pots and pans so you can make use of the space you have available in your kitchen. You can even hang them in the window! The most obvious place to store your pots and pans is in a base cabinet near to your oven. To avoid the annoying nesting issue you simply need to use an organizer which could be freestanding or attached to the cabinet. There is a reason this is one of the best rated pan organizers available and it’s because it’s so flexible. You can use it vertically and slide your pans in, which is like the nesting effect but you can actually get the pan you want without shuffling. Or you can use it horizontally and have your pans lying on their sides. It’s also entirely up to you whether you leave it free standing or mount it to the shelf with screws (which is perfect if you’re in a rental and don’t want to install anything). This flexibility means you can fit more than one stand in your cabinet if you need to. And if you use it horizontally you might well have some air space between the stand and your shelf to slide one of these under shelf storage baskets in, which are perfect for storing your pan lids. The only thing more tricky to store than your pots and pans are the lids! Luckily this is easily solved with a door mounted pot lid rack like this one. Hanging your pot lids inside the cabinet door uses up that dead airspace and keeps them neat and tidy. This organizer is made from heavy gauge metal so it’s nice and sturdy and has a stylish chrome finish. The rack comes with two inch screws which are perfect for attaching it to the wall, but too long for attaching to a cabinet door, so you’ll need to pick up some shorter screws. 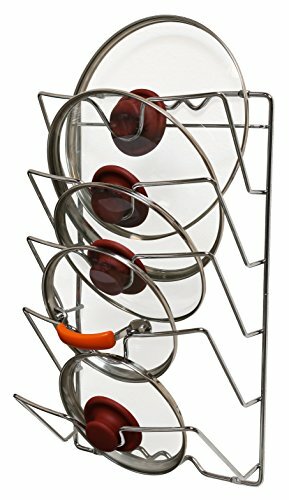 If you are a fan of slide out organizers for maximising the space in your kitchen cabinets you’ll be pleased to read that there is a pull out organizer designed specifically for cookware. The bottom tier has room for your pots and pans and the top tier is designed to keep your lids neat and tidy. The two tiers can be pulled in and out independently of the other. The organizer comes in two different sizes depending on whether you have a narrow or wide cabinet available. As with all the other Rev-A-Shelf organizers they are a little tricky to install (but worth the patience) you can see some helpful installation tips here. If you love the idea of nofollow/hanging storage for your pots and pans but you still want them out of sight this pull out organizer is a clever solution. It fits inside a standard cabinet that just needs to be about two inches wider than your widest pot, and if you have a cabinet wide enough you can even put two side by side. The organizer attaches to the underside of the cabinet carcass/countertop so it won’t work if you have a drawer in the top space. It’s a very popular organizer but there was a one star review that jumped out at me, where the guy was suggesting it would be pretty easy to DIY one of these. I did some googling and sure enough there’s a step by step tutorial that shows you how to make one for around 35 bucks using a set of drawer slides (like these) and some screw hooks (like these). If your kitchen is short on cabinet space but you have a wall going spare why not move your pots and pans up on a wall rail or rack instead? This stainless steel rail is 31.5 inches wide and includes 10 S hooks for hanging your pots and pans. 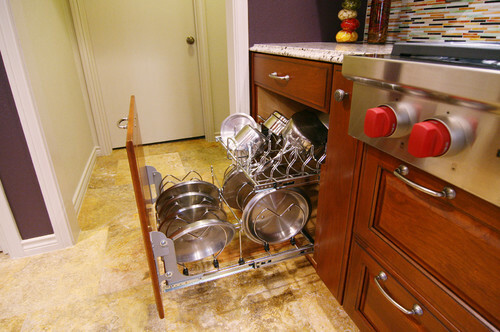 Your pot lids slot neatly behind the top of the rail to keep those tidy too. It’s strong enough to hold up a Cuisinart cookware set weighing around 15-17 pounds if installed properly. Fixings are included but make sure you check that they are suitable for your wall (i.e. dry wall vs plasterboard) as you might want to take a trip to your local hardware store to get the right fixings. This popular wall rack has a handy shelf for storing larger pots and cookware, as well as six hooks on the underside for hanging smaller pots and pans. It’s nice and sturdy and the shelf is made of natural wood which you could paint to match your kitchen decor if you wanted to. The shelf is 36 inches wide by 8 inches deep, but you could make it narrower by sawing off either end if you were happy doing a little DIY. I love that this person had the very clever idea of adding one of these onto the shelf to store their pot lids! This wall pot rack is so unusual I had to share it (and I’m developing a “thing” for greenery in my kitchen!). I love those curved brackets and it’s so unique to have them going up above the rack rather than underneath with a typical shelf. It’s not quite as wide as the previous shelf but is a little deeper at 24 inches by 9 inches and then it’s 19 inches tall including those brackets. There are nine hooks included for hanging pots or other kitchen utensils. One thing to note is that while the rack itself is super sturdy the included fixings are lacking a bit in quality. As always you need to make sure you have the right kind of fixings for your wall so take a trip to your local hardware store and ask for advice. 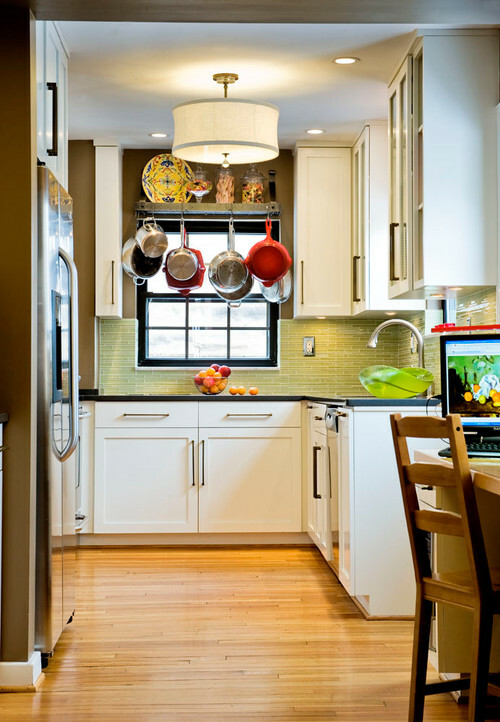 Using a pot rack suspended from the ceiling is another clever way to free up cabinet space. This is the perfect solution if you have an island or peninsular in your kitchen. Just be sure to hang the rack so that the pots can be reached without needing to stand on a chair, but that they’re not so low people bump their heads on them! If you like the style of the wall rack I just showed you but you really want your pots to hang from the ceiling then check this one out. It measures 14 inches wide by 24 inches long and hangs down 16 inches from the ceiling. If you have a low ceiling and want the rack to sit slightly higher up (to avoid bumping your head on your pots) you can buy a set of low ceiling arms. Fixings are included but as always talk to your local hardware guy to check that they are suitable for your ceiling (you don’t want those pots to come crashing down). The grid is also included which gives you extra storage space on top for those “special occasion” pots, or a nice trailing plant! If black isn’t your colour this wooden rack might be more to your taste. I like that it comes with a whole variety of different hooks (26 in total!) 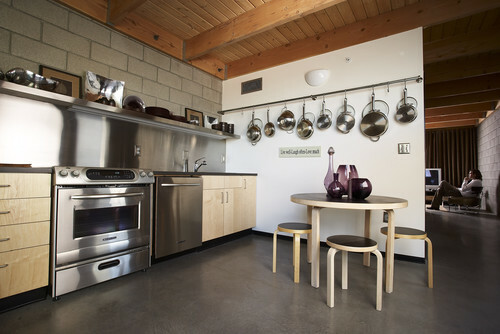 so you should be able to hang any pan you like up on the rack as well as your colander and kitchen utensils! It also has a mesh shelf for storing the pans you don’t use regularly. 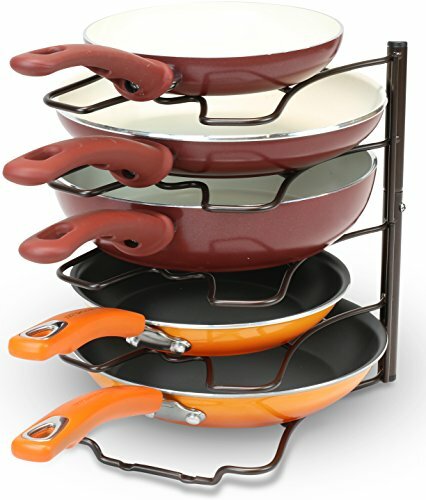 If you have a lot of cast iron pots and are wondering whether it will be able to hold them all safely check out the comment here, because that person has a LOT of pots and pans hanging from their rack! You can even hang your pots in the window! If you love the idea of hanging your pots and pans but you just don’t have a spare wall or ceiling space then think about hanging them in the window. I love how this person added a fruit basket to either side of their rack, now that’s what you call making use of all available space! And there you have it: 10 clever ways to organize your pots and pans by hiding them or hanging them! 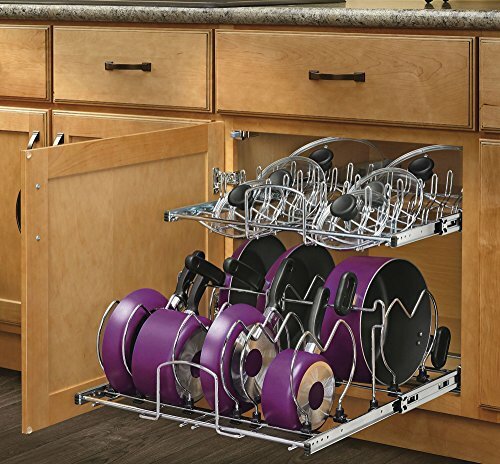 Previous PostPrevious You’ll LOVE these Under Kitchen Sink Storage Solutions!